This Colonial Revival style building has two stories with an asphalt shingle roof, 7-bays, a center entrance, and masonry construction. The building is intact. The hipped roof has overhanging eaves, modillions, and dentils in the cornice band below. The brick is laid up in a variation of common bond (headers interspersed with stretchers every 7 rows). There is stone quoining. There is a 2-story pedimented pavilion, with modillions & dentil bands, and 4 fluted Corinthian columns paired with matching pilasters behind. The lantern atop the building has a gilded dome, garland swags, modillions, paired Ionic columns, an arcade flanked by pilasters, and a balustrade atop square platform. Windows have stone window headers and splayed headers with 3-part keystones. The door surround with molded hood has dentils, is supported by console brackets, and displays a geometric pattern in the transom. The Left side entry has a pedimented porch supported by Doric columns. There is a large 1-story rear ell, 6 bays deep, with an exposed basement and hipped roof. The use of neoclassical style for this building reflects the popularity of this style during this period, particularly for civic buildings. The red brick and white classical trim of the Town Hall is evocative of the Curtis Hotel, which stands directly across the street. 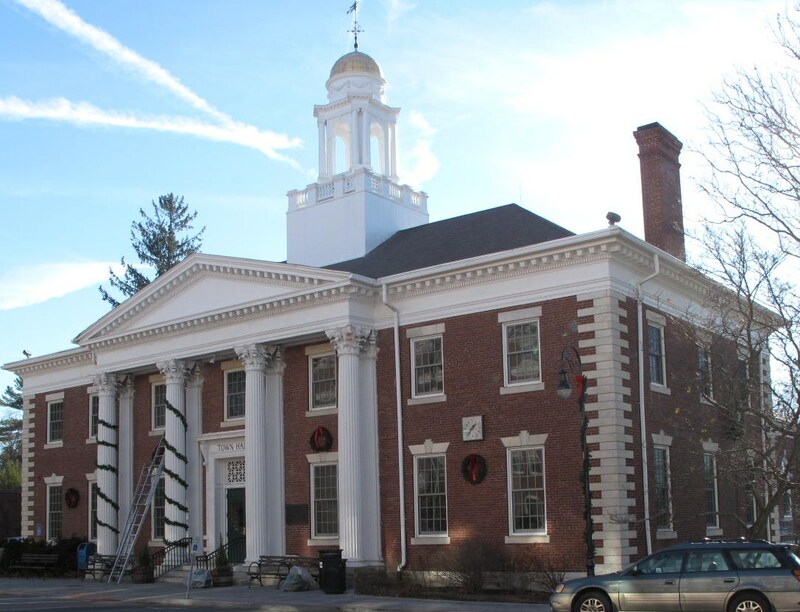 This structure was built to replace the first County Courthouse, which had housed town offices since 1816. In 1816 the courts moved to the brick building, which now serves as the Lenox Library. The new Town Hall contained a post office, as the older one had, and also space for a bank, police station, and fire station. After the new firehouse was built adjacent to the Town Hall, the rear of the building was used for a time as an opera house. It is still used as the Lenox Town Hall. The 1905 Sanborn Map labels rear ell as “Opera House”. Henry F. Withey, AIA and Elsie Rathburn Withey, Biographical Dictionary of American Architects (Deceased)(Los Angeles: Hennessey & Ingalls, Inc., 1970) p. 264.